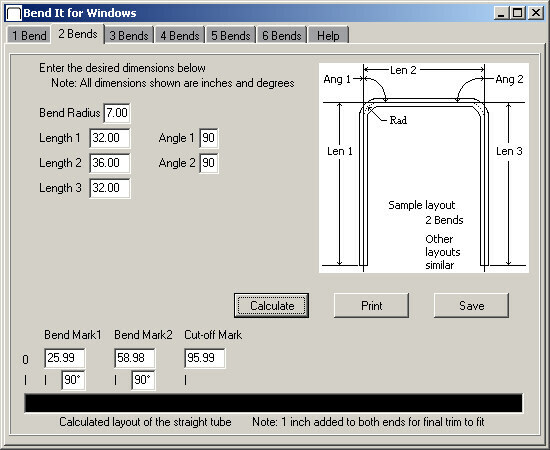 Bend It for Windows is a free program that is used to calculate and layout the bend marks on a straight piece of tubing when fabricating roll bars and roll cages for race cars. To the best of my knowledge, this was the first program developed and written for this purpose. I first wrote this program in 1997 after I purchased a Mittler Brothers tubing bender to build a roll cage for my own race car. After starting this project, I quickly discovered that trying to calculate all of the lengths and angles was difficult with a notebook, a pencil and a calculator in the garage, so I decided to create a program to help with this problem. This program is easy to operate and takes very little disk space to install and to run. Bend It can be used with Windows 95 and later computers. Bend It Online is a new web based application for most internet connected smartphones, tablets and computers. If you have any questions or suggestions, please send these by . Bend It Online is a new web application for most internet connected smartphones, tablets and computers. An option for metric dimensions was also added in this version. Bend It for Windows is written to work with Windows 95 and later computers. This program can be downloaded below is a self-extracting installation program that creates and copies the necessary files to your PC. This process also creates a new shortcut on the main Windows screen and a new program choice in the Start menu. The only extra requirement for this program is that the standard Windows file named Notepad.exe must be in your default Windows directory if you wish to print or save the projects that you calculate. To upgrade this program to the latest version, simply download the latest version below and install this over your older version. Please make sure that your existing Bend It program is not running when you start the installation of the newer version. If you are not sure what version of Bend It you are currently running, just click on the Help tab at the top of the main Bend It program screen. This is a very simple program and it was written before Windows Vista and Windows 7 were released, so do not be surprised if you get an alert during the installation that warns you about the publisher not being known or similar. This program does not contain a virus or spyware and it does not send any information back to me since it is free for anyone to use. It is also possible that the latest anti-virus programs may warn you during the download process or the installation process for the same reasons listed above. The most important step is to measure your layout at the centerline of the tube. You will need to enter your desired finished dimensions and angles as shown above. These dimensions must be measured between the end of the tube and the centerline intersection points of the bends. If you are trying to fit a custom rollbar into a car, it might be helpful to make a full sized cardboard template that fits the vehicle. You can then measure the centerline intersection points exactly from the template and enter these values into the program. After the necessary dimensions have been entered, the program will then calculate the start marks for each bend which can be transferred onto a straight piece of tubing. Bend It will only work with a tubing bender that has a rotating die set. This program will not work correctly with a pipe bender that starts the bend in the middle of the radius. More Questions or Layout Problems ? Bend It is a free program that was written to help other racers and it should not be sold for profit. Since this is a free program, there is no warranty for any use of this program and I assume no responsibility for any loss or damage that may result from any use of this program. It is always a good idea to verify your calculations on a piece of test material before you start bending the final project.